It is not hard to find examples in which the threat to work incentives is real. Not long ago, in a post on labor market adjustments to trade shocks, I cited a recent report from the Congressional Budget Office, according to which taxes and benefit reductions can claw back as much as 80 percent of each dollar of additional income earned by households whose income is just above the poverty level. Careful analysis of the data and research demonstrates, however, that such charges are largely incorrect and that it pays to work. What is going on here? How can it be that the same data support both the view that the social safety net discourages work, and that it does not? 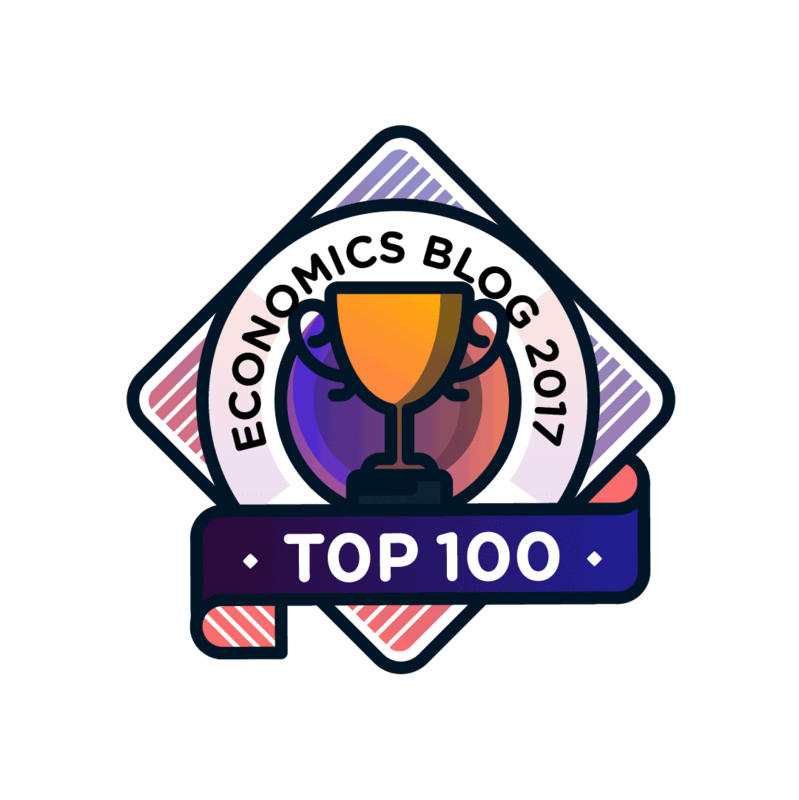 The debate over the safety net and work incentives centers on the issue of effective marginal tax rates (EMTRs). A household’s EMTR is the sum of the benefit reduction rates on all social programs for which it is eligible, plus the the marginal rates of any taxes paid. For example, consider a household that receives food stamps, subject to a benefit reduction rate of 24 percent; housing benefits, subject to a benefit reduction rate of 30 percent; and earns minimum wage income subject to a 7 percent payroll tax. The EMTR for that household would be 24+30+7=61 percent, meaning that the household’s net income, after benefit reductions and taxes, would rise by just $39 for each $100 earned. As the following chart from the CBO report shows, EMTRs vary over a wide range, both between and within income groups. Which parts of the range you choose to emphasize depends, at least in part, on your political objectives. The data on which the chart is based include federal and state taxes paid, the Earned Income Tax Credit (EITC), food stamps (SNAP), cost sharing subsidies for health insurance, and the child tax credit. They do not include Temporary Assistance for Needy Families (TANF), Medicaid, or housing subsidies. In their efforts to justify budget cuts, conservatives find it useful to select examples from the least favorable regions of the chart, found at the tops of the bars in an income range just above the poverty level. Such examples fit the “hammock” scenario, making make safety net programs look counterproductive. In contrast, progressives, who would like to expand the safety net, prefer to emphasize cases where EMTRs are at a minimum. 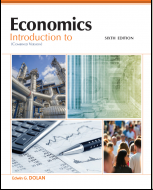 For example, Schapiro et al. lead off with an example of a single mother with two children who, starting from zero, takes a half-time job at the minimum wage, thereby doubling her income, including benefits. We can see that the example comes from the most favorable range on the CBO chart. But if the half-full vs. half-empty distinction were all there were to this story, it would hardly be worth blogging about. It turns out there is much more than that. Read on. The chart shows that the highest EMTRs occur in the range of 100 to 149 percent of the poverty level. In the middle of that range, between 120 and 125 percent of the poverty level, the EMTR for a single parent with one child can reach 80 percent, even without including programs like housing assistance and daycare subsidies. However, looking at all low- and moderate income families, the CBO calculates that the mean EMTR is only 31.3 percent. When only the employee’s share of payroll taxes is included (As Schapiro et al. argue should be the case), the mean EMTR is just 24.3 percent. The often-cited examples are generally atypical worst-case scenarios that apply only to a small fraction of families with children — namely, families that: a) have income in certain fairly narrow ranges, typically just above the poverty line; and b) receive an unusual combination of government benefits, all or most of which phase down in the same income range. 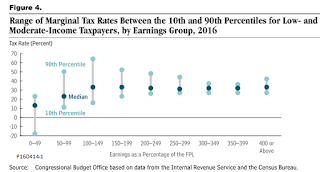 We estimate that only about 3 percent of single mothers with two children and earnings below 150 percent of the poverty line (below about $29,000) receive the EITC, SNAP, and either TANF or housing aid (or both) and are in the earnings range where these benefits all phase down simultaneously—and consequently face marginal tax rates above 80 percent. The proportion is even smaller for other family configurations. This is a curious defense of the social safety net to hear from a progressive source. Yes, work incentives are intact for most low-income households, but it pays to work, not because the safety net is well designed, but because its coverage is so limited. The question is not whether people start out life in homogeneous circumstances, [Jones] adds. "The question is whether government policies that try to fix this actually make things better or worse." Worse, in most cases. Government "help" encourages poor people to be dependent and passive. Dependent people stay poor. As I understand it, Shapiro et al. do more to confirm this contention than to refute it. What they say is that most poor people do have an incentive to better themselves, but only because they do not qualify for most safety net programs. Meanwhile, those few who do get enough help to lift themselves above the poverty level do face incentives to remain dependent and passive. It is hard to see what there is for progressives to boast about here. There are really only two options to lowering marginal tax rates. One is to phase out benefits more slowly as earnings rise; this reduces marginal tax rates for those currently in the phase-out range. But it also extends benefits farther up the income scale and increases costs considerably, a tradeoff that many policymakers may not want to make. The second option is to shrink (or even eliminate) benefits for people in poverty so they have less of a benefit to phase out, and thus lose less as benefits are phased down. This reduces marginal tax rates, but it pushes the poor families into — or deeper into — poverty and increases hardship, and thus may harm children in these families. In effect, the second option would “help” the poor by making them worse off. That is too pessimistic, in my view. It implicitly accepts the conservative claim that any safety net that offers the breadth of support that progressives would like to see must either strain the federal budget or destroy work incentives. Fortunately, there are options that escape that dilemma. 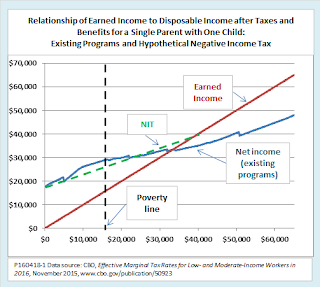 One idea, far from new, would be to replace the current tangle of overlapping programs with a single negative income tax that would phase out more gradually as incomes rise. The following chart shows how an NIT would compare to existing programs, based on the CBO’s example of a single parent with one child, living in Pennsylvania in 2015. The red line shows the family’s earned income. 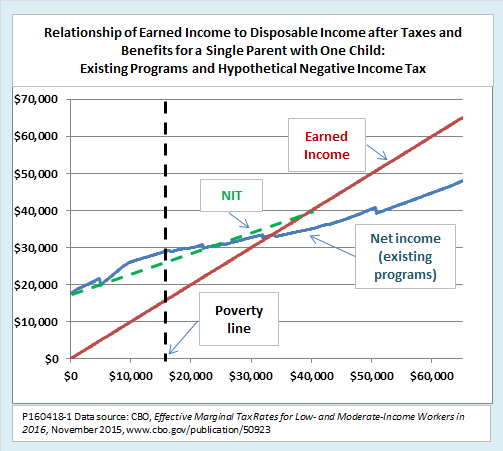 The blue line shows net income (earned income plus benefits minus taxes paid) under existing programs. The effective marginal tax rate is one minus the slope of the blue line. At its flattest, around 120 to 125 percent of the poverty line, the EMTR for the blue schedule reaches 80 percent. What is more, there are numerous notches, where the benefits of some program are completely lost as the household passes some income threshold. The green dotted line shows a hypothetical NIT schedule. In this case, NIT benefits start at $18,000 a year, which is the average benefit provided to zero-income households under existing programs. It is then phased out smoothly at an EMTR of 45 percent until benefits fall to zero at an earned income of $40,000, or about two-and-one-half times the poverty line. If there were no change in work behavior, the total cost of the NIT for families receiving benefits under the NIT would be approximately the same as the cost for families receiving positive net benefits from existing programs. If the lower EMTR resulted in more paid work by families now receiving benefits, the NIT would cost proportionately less. 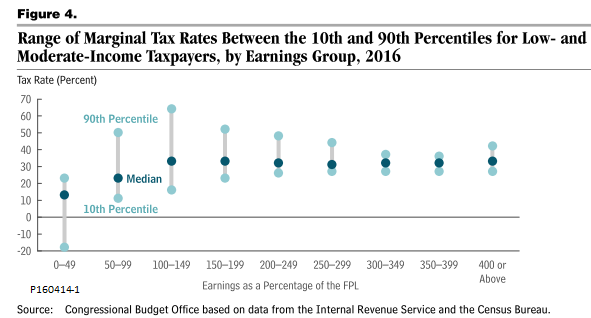 After adjusting for changes in work behavior, it would also make sense to revise the schedule of income and payroll taxes paid by moderate-income workers just beyond the breakeven point (not shown here) in order to maintain work incentives in that range and make the whole program revenue neutral. A more radical design change would replace most or all existing safety net programs with a universal basic income (UBI), a subject on which I have written in detail elsewhere. By a UBI, I mean any program that provides a fixed cash grant to everyone (in my version, all resident citizens) without regard to income or labor force status. UBI benefits are not reduced as income rises. Because there is no phase out, they have no effect on effective marginal tax rates. As a result, EMTRs would decrease for any household currently receiving means tested benefits under any program replaced by the UBI. A UBI would be affordable so long as it replaced existing transfer programs rather than adding to them. For low-income households, the UBI would replace means tested programs such as EITC, TANF, SNAP, and housing assistance. For middle- and upper-income households, the UBI would replace “middle class welfare” such as deductibility of mortgage interest and interest on retirement savings. The UBI would not need to replace all transfer programs so long as “double dipping” was not allowed. For example, a retired person could choose between Social Security benefits or UBI benefits, whichever was greater, but could not take both. In this way, a UBI would entirely circumvent the dilemma of means-tested programs that Schapiro et al. describe. It could provide needed resources to households with low earned income, or none, without imposing high effective marginal tax rates. At the same time, it would not increase net tax burdens on middle- and upper income households. Conservatives are right to emphasize the need to maintain strong work incentives for beneficiaries of the social safety net. With only a few exceptions, though, they have shown little interest in reforming or replacing existing programs. Instead, they have seized disincentives as a weapon in their campaign to reduce government spending, taxes, and deficits. They have been partially successful in doing so. For example, the share of poor families receiving cash assistance from TANF has fallen steadily as states have narrowed eligibility requirements and even added petty restrictions like listing the types of entertainment permitted for TANF beneficiaries. Eligibility limits have, on average, reduced the disincentives to which low-income households are exposed, but it makes little sense for progressives to cite that fact as a defense of existing programs. Quite the opposite. If progressives ever managed to roll back the restrictions on eligibility that conservatives have imposed, work disincentives would reemerge in full force. Progressives should instead support fundamental redesign that would simultaneously broaden coverage and encourage low-income families to become more active in the labor market. Voters are Angry About Free Trade: What is the Right Policy Response? The disincentive effects are likely overstated as the typical low wage earner has little control over pay and hours. Their choice is between a job or possibly two with possible a spouse that may work or not, so rather than a curve, face only a few, well separated points, if even that since many jobs entail restrictions on other work.